Derive: aimless, random drifting through a place, guided by whim and an awareness of how different spaces draw you in or repel you. 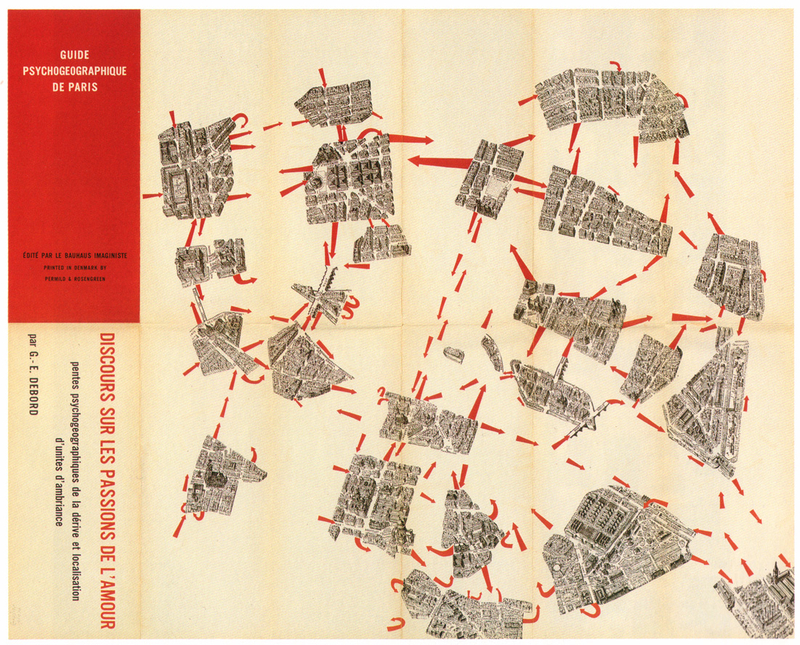 “Unfold a street map… place a glass, rim down, anywhere on the map, and draw round its edge. Pick up the map, go out in the city, and walk the circle, keeping as close as you can to the curve. Record the experience as you go, in whatever medium you favour.” Robert MacFarlane, Psychogeography: A Beginner’s Guide. 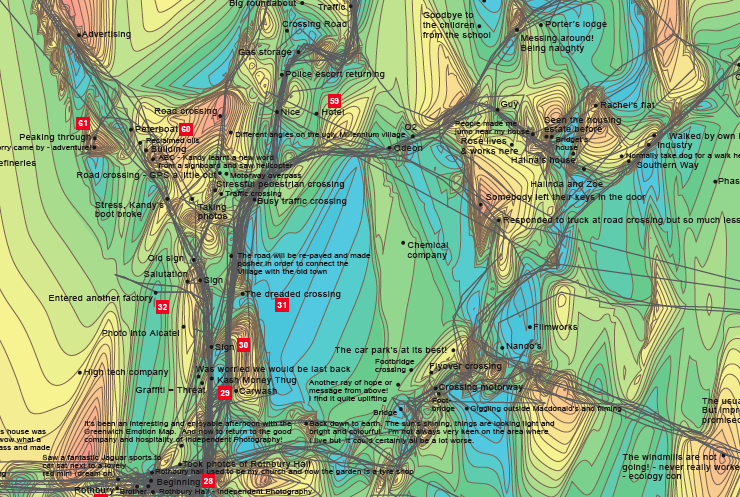 “The production of psychogeographic maps, or even the introduction of alterations such as more or less arbitrarily transposing maps of two different regions, can contribute to … complete insubordination of habitual influences. A friend recently told me that he had just wandered through the Harz region of Germany while blindly following the directions of a map of London.” Debord, Introduction to a Critique of Urban Geography. “To derive was to notice the way in which certain areas, streets, or buildings resonate with states of mind, inclinations, and desires, and to seek out reasons for movement other than those for which an environment was designed.” Sadie Plant, The Most Radical Gesture. 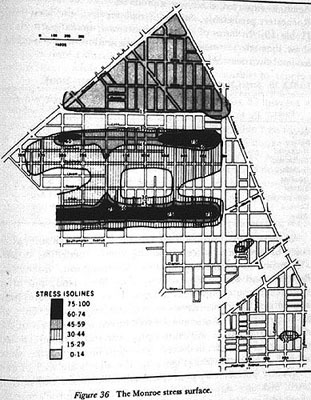 “The sudden change of ambiance in a street within the space of a few meters; the evident division of a city into zones of distinct psychic atmospheres; the path of least resistance which is automatically followed in aimless strolls (and which has no relation to the physical contour of the ground); the appealing or repelling character of certain places–all this seems to be neglected.” Debord, Introduction to a Critique of Urban Geography. “There’s a difference between knowing the Path and walking the Path.” The Matrix. We are so tuned out, focused on getting through places for practical reasons (get to school, to work, etc.) that we don’t pay attention to places and the way all our senses and emotional awareness can be used to know these places. What places attract us? Which repel us? Why? In front of me, on the desk where I write, I’ve assembled a bunch of instruments useful in measuring the environment, instruments that I’ve found around the house. In front of me, on the desk where I write, I’ve assembled a tape measure, a yardstick, a stopwatch, a watch, a goniometer and an arm protractor, a clinometer, a map measure, a compass, a wall thermometer, a pocket thermometer, a percentage protractor, a level, a plumb, a light meter, a camera, a pocket scale, a postage scale, a barometer, a measuring cup, a set of measuring spoons, a pedometer, a stud finder, and a passel of questionnaires. Some of them, like the pedometer, no longer work, but still I hold on to them. Others, like a couple of the questionnaires, never worked at all, but even these I am loathe to throw away. All of them have told me, or promised to tell me, something about my world, and since the world is something I’m eager to know about, I’m not eager to part with these instruments, functioning, flawed, or broken down. It’s 84º F where I sit at 11:30:36 in the morning. It’s nine minutes and forty-seven seconds since I typed the first word in this paragraph. There’s another instrument in this room and I am it. I would have said it was stuffy where I sit and that half an hour had passed since I started writing, although my stop watch now says it’s been eleven minutes and thirty-eight seconds at, according to my other watch, 11:34 on the nose. I won’t argue with my instruments. They’re measuring different things than I. My thermometer knows nothing of the humidity oppressing me; my watches, recording the pressure of their drive springs, know nothing of the pressure of trying to say something with words. Who should say which is superior instrumentation? Not I, certainly. My watches and I, we’re holding up the world against different standards, but both of these are interesting and valuable and important. GPS (Global Positioning System) + GSR: The Bio Mapping tool allows the wearer to record their Galvanic Skin Response (GSR), which is a simple indicator of emotional arousal in conjunction with their geographical location. 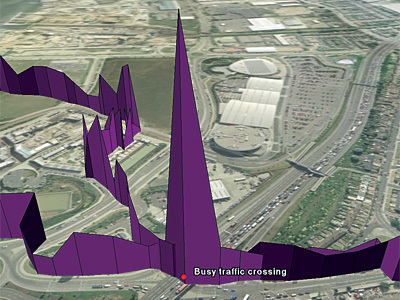 This can be used to plot a map that highlights point of high and low arousal. By sharing this data we can construct maps that visualise where we as a community feel stressed and excited. 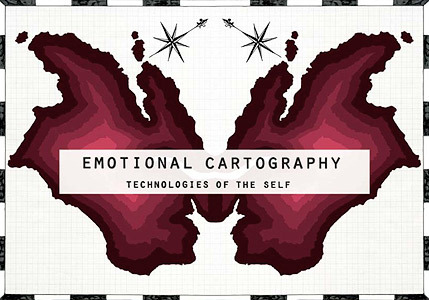 Emotional Cartography – Technologies of the Self. Edited by Christian Nold, 2009. PDF of entire book here. This entry was posted on Sunday, June 14th, 2009 at 10:05 am and is filed under Lecture. You can follow any responses to this entry through the RSS 2.0 feed. You can leave a response, or trackback from your own site.